What makes a neighborhood? Sometimes that’s hard to figure out. I’ve lived in a number of places. Not all of them seemed like neighborhoods. When I was first on my own I used to bemoan that my fellow renters could hardly be bothered to return a wave but someone kept stealing my newspaper. One day, walking home from the grocery store, I realized to my chagrin that I recognized names on mailboxes but couldn’t put faces to those names. I never did much to make that a neighborhood. Then we moved to a little house. It was silly how hard it was to meet the neighbors. They’d wave but that’s about it. It took nearly a year to meet the older couple across the street. (They seemed old to me then because their kids were teenagers. Not so funny in retrospect.) Our mailbox was on their side of the street. I tried get my mail when one of them went out to collect theirs so I could introduce myself but they tended to scurry back in the house as if my nearly 5’3 stature blocked their share of sunlight. Finally I baked a loaf of bread, knocked on their door and said I was sorry we hadn’t gotten a chance to meet. They turned out to be lovely people. They still write long chatty updates to me years after we moved away. I began to understand that it takes effort to make a neighborhood. So I greeted everyone who moved onto our street with homemade goodies. I shared produce from my garden and offered to help others in any way I could. I also started inviting people over. In the fall we had bike parades where the kids spent a happy hour or so decorating their tricycles, scooters, and bikes to ride around the neighborhood in a grand procession before coming back to our house for a picnic. We had cookouts, Halloween parties, and Christmas caroling parties. We met up for working get-togethers such as picking apples and making applesauce. The major neighborhood bonding events were our summer pig pen parties. These were grand messy BYOB affairs, as in bring your own bucket–of dirt. The dirt was dumped in a backyard kiddie pool and mixed by all the kids in attendance into perfectly creamy mud, which they used to coat themselves until they were recognizable only by bathing suit outlines. We put a garden hose at the top of our slide and the kids careened down in glorious streaks of mud. We handed out cans of shaving cream for use as body décor (with firm instructions to avoid faces because it’s not fun in the eyes). And we insisted the kids eat without utensils or hands, just direct face to plate. Like pigs. Of course these parties got out of hand once the grown-ups refused to sit in lawn chairs watching the kids have all the fun. Some neighbors showed up in pig masks, others showed up with water balloons sneakily hidden in baby strollers and little red wagons, others brought massive auxiliary supplies of shaving cream. Normally well-behaved men used hoses to fill garbage cans with water, which they dumped over the heads of the few civilized mommies who thought they’d keep their hair looking nice. One year the entire assemblage of pig pen partiers were incensed that a regular pig pen attendee decided to stay home to repair a fence. All of us walked down to the street in wet, muddy, shaving cream streaked glory to drag him to the party. His police chief father who was there helping him make the repairs looked seriously alarmed. We dragged him anyway. That was years ago. Now we live on a small farm. Maybe because the houses are farther apart, maybe because it’s a rural township, maybe it’s due to other complications but it has taken years to feel connected in a neighborly way. Yet it’s still a neighborhood. When a child is lost everyone turns out of their homes to tramp through the woods, fields, and streams until she’s found. When a car is stuck in a ditch, someone will get out a tractor to pull it free day or night, simply saying “no problem.” People offer the bounty from their fruit trees and willingly share equipment. I still harbor the ideal of a vibrant neighborhood but I’m grateful for the goodwill we’ve slowly managed to find here. I’m learning that neighborhoods vary but making the effort to approach each other can make all the difference. 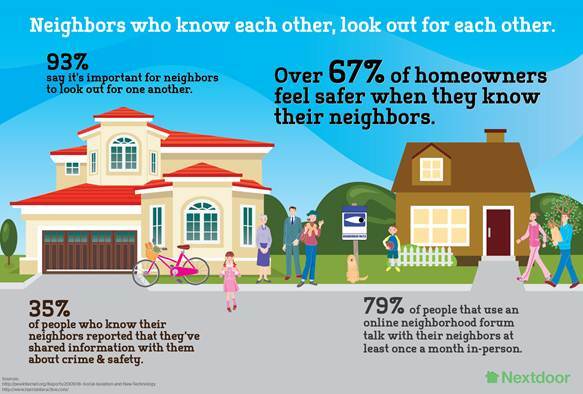 How do your build a closer neighborhood? Organize a neighborhood work-sharing group. Establish porch events or block parties. How to share with your neighbors.